Perhaps with the exception of the odd East End boozer and the ready availability of Waitrose, there are not many things to miss about no longer being in that there London. However, living as we do in the heartland of Greggs, we have yet to find any bakers which sell a decent loaf – some have made wild and reckless claims of Sour Dough or Ciabatta, but all have so far delivered a variation on the Standard British White. Hence the ever-greater need to keep baking and hence these Cheesy Rolls. *It’s important that the cheese is cubed rather than grated as this will give you a much cheesier flavour. Put the flours, yeast, salt and mustard powder in a large bowl and mix together. Add the cubed cheddar and parmesan along with a few generous grindings of black pepper and mix. Add the warm water and beaten egg. Mix everything to form a dough. Cover with a cloth and set aside for a quarter of an hour. Divide the mixture into six pieces and roll each into a big fat sausage shape. Place on a baking sheet lined with non-stick paper. Leave some space between them as they are going to increase in size. Lightly cover with oiled cling film and set aside somewhere warmish until they have doubled in size. Bake for about 20–25 until golden brown. 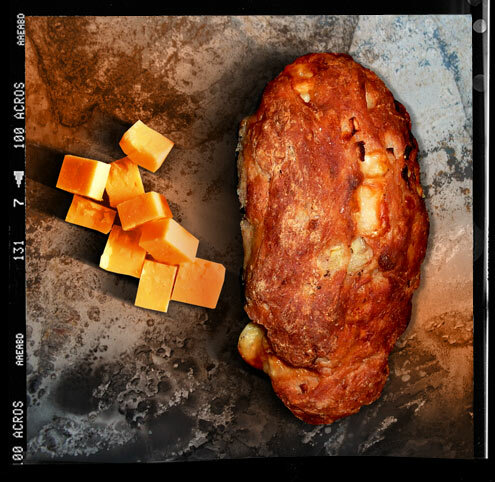 With any luck you should have chewy bits of melted cheese left on the baking paper – peel off and enjoy. Verdict: A substantial and tasty roll with cheeky little pockets of chewy cheesiness. Why not load it up with yet more cheese (and salad) and take it to work for a satisfying lunch? Drink: K4e from Eastern Bloc. Entertainment: Exploring the Northern Quarter.